Guess The Emoji is a simple game where you will see some emojis and you will need to guess what they mean. It could be anything, from a famous person to proverbs, movies or quotes. 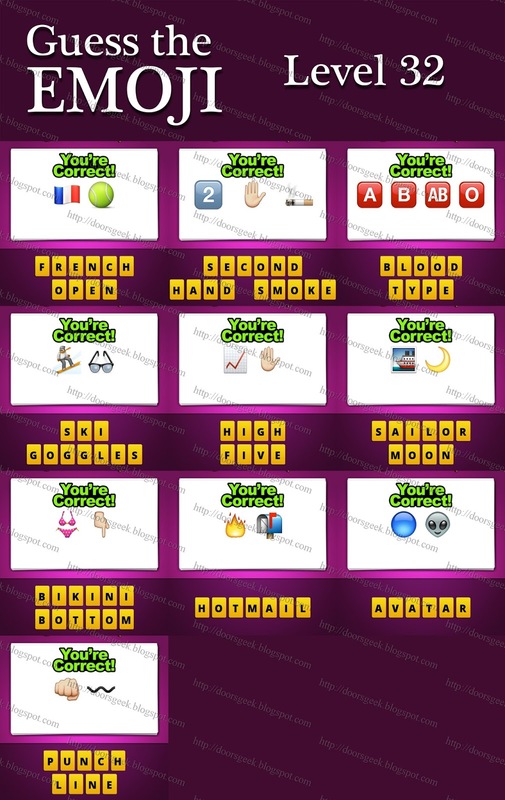 If you are stuck in Level 40 and you are looking for an answer to one of the emoji you will find the correct ones here. French Wine - the French flag emoji and a glass with red wine. Macbook Air - the red apple emoji followed by a blue opened book and a smoke cloud. Apple Bees - the red apple emoji followed by 3 bees. Fast and Furious - the red car emoji followed by a smoke cloud, a "+" and a angry red face. Speed - the bomb emoji followed by a orange bus and two smoke clouds. Ted - the brown teddy bear head followed by a red heart emoji, two beer mugs and a lit cigar. Around the Clock - the blue square emoji with two curved white arrows inside followed by a red alarm clock emoji. Underdog - the hand emoji pointing down and the face of a puppy. Lady Luck - the woman face emoji followed by a slot machine "777" and a green clover emoji. James Bond - the black gun emoji followed by a cocktail glass, a pink bathing suit emoji and the flag of England. Guess The Emoji Level 40 Answers, Cheats, Solution for Android, iPhone, iPad. Guess The Emoji is a simple game where you will see some emojis and you will need to guess what they mean. It could be anything, from a famous person to proverbs, movies or quotes. 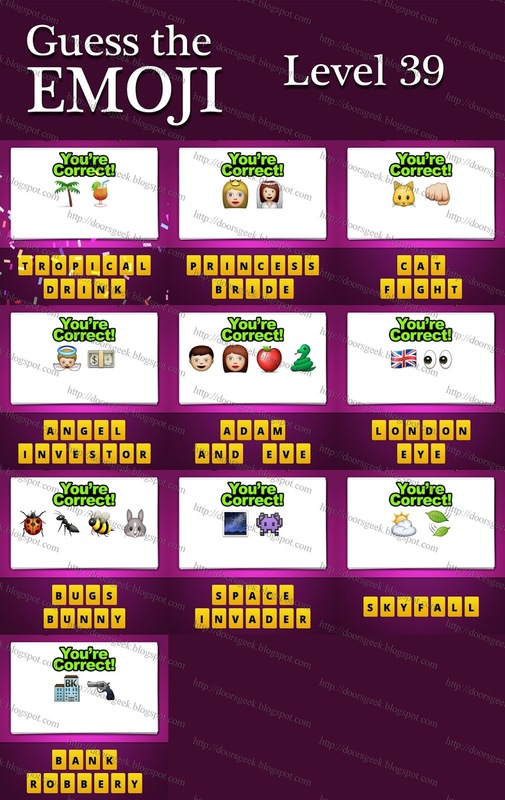 If you are stuck in Level 39 and you are looking for an answer to one of the emoji you will find the correct ones here. Tropical Drink - the palm tree emoji and a red cocktail glass. Princess Bride - the girl with a golden crown on her head followed by a emoji made from a bride. Cat Fight - the yellow cat face emoji and a fist. Angel Investor - the angel child emoji and a pack of dollars. Adam and Eve - the face of a boy followed by a girl, then there is a red apple emoji and a green snake. London Eye - the flag of England emoji followed by a pair of eyes. Bugs Bunny - the ladybug emoji followed by a and and a bee, and the last emoji is a grey rabbit. Space Invader - the picture with a blue night sky and a purple pixel monster emoji. Skyfall - the sun behind a white cloud emoji and 2 falling green leaves. Guess The Emoji Level 39 Answers, Cheats, Solution for Android, iPhone, iPad. Guess The Emoji is a simple game where you will see some emojis and you will need to guess what they mean. It could be anything, from a famous person to proverbs, movies or quotes. 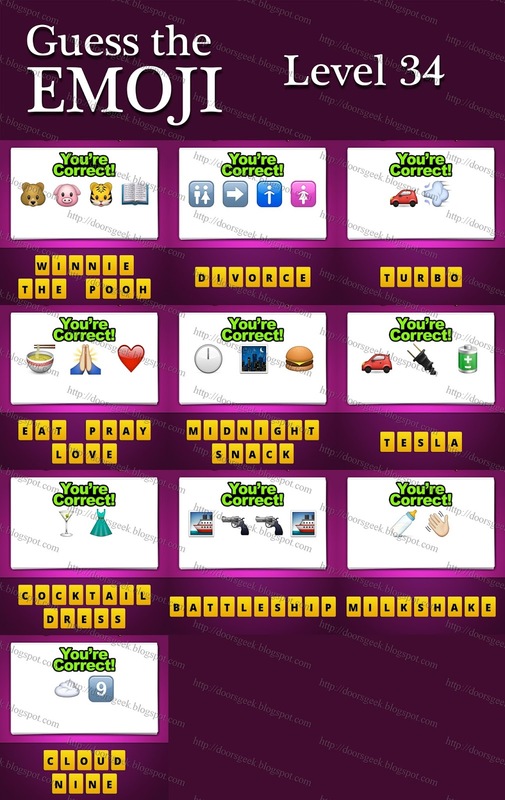 If you are stuck in Level 38 and you are looking for an answer to one of the emoji you will find the correct ones here. Sake Bomb - the cup and bottle emoji followed by a lit black bomb. Sin City - the 3 purple devil faces followed by a orange city picture emoji. Happy Hour - the white clock emoji followed by a happy face and a beer mug emoji. Shoe Horn - the brown leader shoe followed by a yellow horn. Game of Thrones - the xbox black controller/joystick followed by a golden crown with 3 purple stones. Zero Hour - the white "0" inside a blue square followed by a red alarm clock. World Champion - the planet earth emoji followed by a golden cup/trophy. Afternoon Tea - a white clock emoji and a white cup of tea/coffee. Youtube - the hand emoji that points to a TV. Hello Kitty - the girl in pink with a hand in the air and a yellow cat face emoji. Guess The Emoji Level 38 Answers, Cheats, Solution for Android, iPhone, iPad. Guess The Emoji is a simple game where you will see some emojis and you will need to guess what they mean. It could be anything, from a famous person to proverbs, movies or quotes. 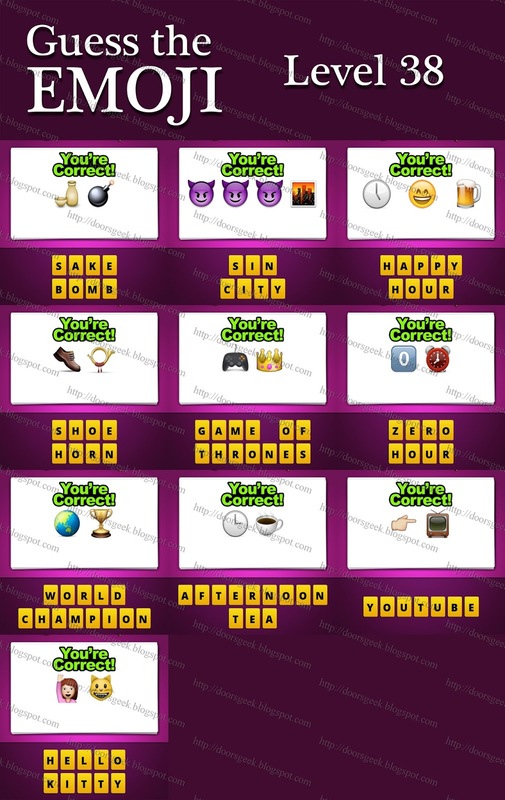 If you are stuck in Level 37 and you are looking for an answer to one of the emoji you will find the correct ones here. Smokey Eye - the lit cigar followed by a pair of eyes. Cowbell - the cow head emoji and a golden bell. Bell Curve - the golden bell emoji and a curved black line. Eiffel Tower - the French flag emoji and a picture with a red tower. Man Purse - the face of a man with black mustache and hair followed by a brown hand bag. X Ray - the red "X" emoji and a black flashlight. Victory Dance - the hand that makes the victory sign followed by a dancing woman in a red dress. Samsung - the white flag with a blue-red circle in the middle followed by a smartphone emoji. Curs Both Ways - the red scissors and a blue square with an white arrow inside pointing left and right. Holy Ghost - the white church emoji and a white ghost. Guess The Emoji Level 37 Answers, Cheats, Solution for Android, iPhone, iPad. Guess The Emoji is a simple game where you will see some emojis and you will need to guess what they mean. It could be anything, from a famous person to proverbs, movies or quotes. 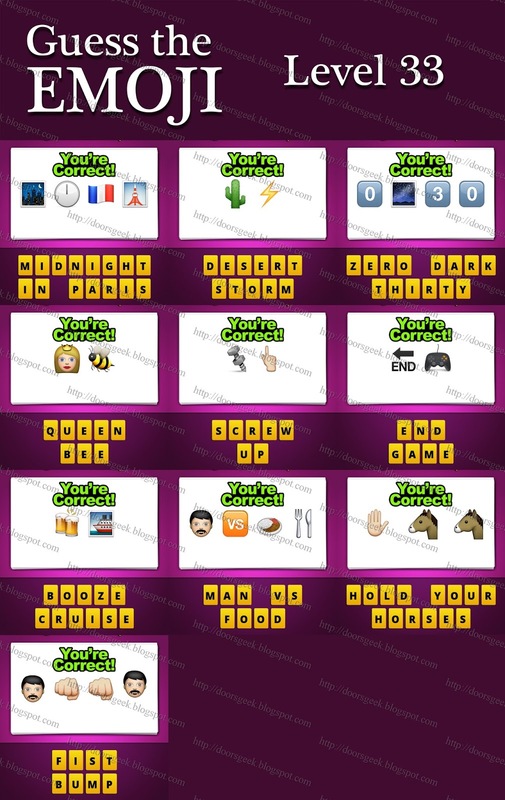 If you are stuck in Level 36 and you are looking for an answer to one of the emoji you will find the correct ones here. Kiss of Death - the red kiss emoji and a grey skull. X Files - the black "X" emoji followed by two grey folders/files. Lucky Thirteen - the green clover and the number "13". Sweet Sixteen - the purple-green candy followed by the number "16". Uptonwn Girl - the blue square with an white arrow pointing up followed by a city picture and the face of an woman. Holy Trinity - the blad old man emoji followed by the face of a bot and a white ghost emoji. Keyhole - the golden key emoji and a red circle emoji. Jackpot - the 3 red cherry emojies. Love Triangle - the red heart emoji and a red triangle. Frog Prince - the green frog face and a yellow crown emoji, with 3 purple stones. Guess The Emoji Level 36 Answers, Cheats, Solution for Android, iPhone, iPad. Guess The Emoji is a simple game where you will see some emojis and you will need to guess what they mean. It could be anything, from a famous person to proverbs, movies or quotes. 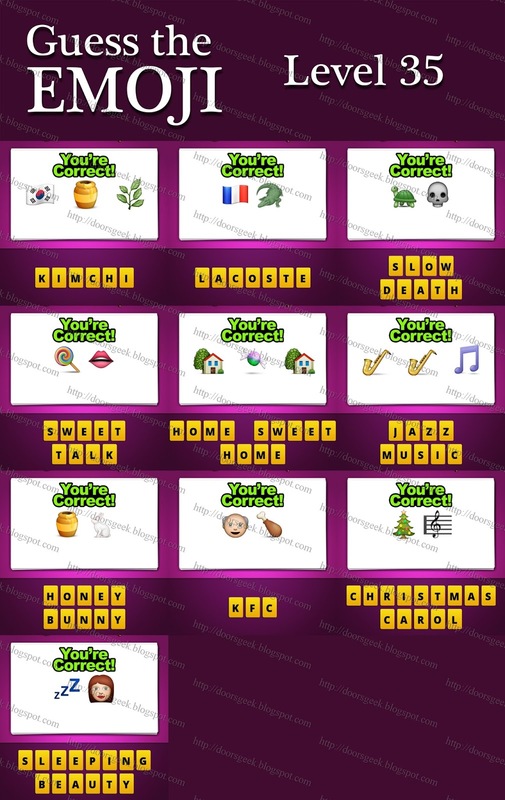 If you are stuck in Level 35 and you are looking for an answer to one of the emoji you will find the correct ones here. Kimchi - the white flag with a blue-red circle in the middle followed by a golden jar and a branch with 5 green leafs. Lacoste - the French flag emoji and a green crocodile. Slow Death - the green turtle emoji and a grey skull. Sweet Talk - the rainbow colored lollipop and pink lips. Home Sweet Home - the two white houses with a candy between them. Jazz Music - the two saxophones emojies and a purple music note. Honey Bunny - the golden jar emoji and a white rabbit. KFC - the bald old man face emoji and a chicken drumstick. Christmas Carol - the christmas tree emoji and a music portative with a key soil on it. Sleeping Beauty - the 3 blue "zzz" and a woman face. Guess The Emoji Level 35 Answers, Cheats, Solution for Android, iPhone, iPad. Guess The Emoji is a simple game where you will see some emojis and you will need to guess what they mean. It could be anything, from a famous person to proverbs, movies or quotes. If you are stuck in Level 34 and you are looking for an answer to one of the emoji you will find the correct ones here. Winnie the Pooh - the bear head emoji followed by a pink pig face, a tiger and a blue opened book emoji. Divorce - the blue square emoji with a man and woman inside followed by a white arrow emoji then a blue square with a man silhouette inside and a pink square with a woman silhouette inside. Turbo - the red car emoji followed by a white smoke cloud. Eat Pray Love - the white bowl with spaghetti and Chinese eating sticks followed boy two hands praying and a red heart emoji. Midnight Snack - the white clock emoji followed by a night city picture and a burger emoji. Tesla - the red car emoji followed by black power plug and a green battery emoji. Cocktail Dress - the cocktail glass emoji and a green dress. Battleship - the two pictures with boats inside and two black guns between. Milkshake - the baby milk bottle followed by a waving palm/hand. Cloud Nine - the white cloud emoji followed by a blue square with an white "9" inside. Guess The Emoji Level 34 Answers, Cheats, Solution for Android, iPhone, iPad. Guess The Emoji is a simple game where you will see some emojis and you will need to guess what they mean. It could be anything, from a famous person to proverbs, movies or quotes. 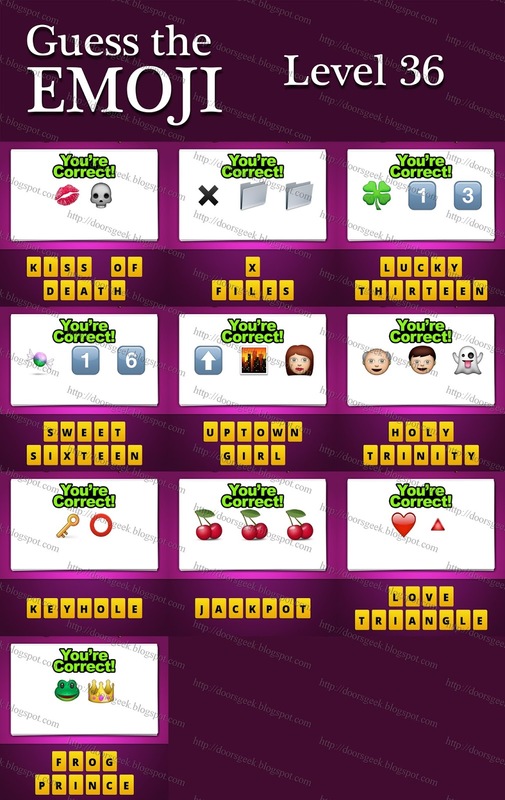 If you are stuck in Level 33 and you are looking for an answer to one of the emoji you will find the correct ones here. Midnight In Paris - the night picture followed by a white clock emoji, the flag of Francce and a picture of the Eiffel tower. Desert Storm - the green cactus and a yellow lightning emoji. Zero Dark Thirty - the white "0" followed by a picture of the night sky and the number "30". Queen Bee - the girl with a yellow crown on her head and a bee. Screw Up - the grey screw and nut emoji followed by a hand pointing up. End Game - the black arrow with "END" written under it and a black xbox controller/joystick. Booze Cruise - the two beer mugs emoji and a picture with a boat. Man vs Food - the man with black hair and mustache followed by an orange square with "VS" inside then a plate with food and a fork with a knife. Hold Your Horses - the palm emoji followed by two horse heads. Fist bump - the two man faces with mustaches and two fists between them. Guess The Emoji Level 33 Answers, Cheats, Solution for Android, iPhone, iPad. Guess The Emoji is a simple game where you will see some emojis and you will need to guess what they mean. It could be anything, from a famous person to proverbs, movies or quotes. 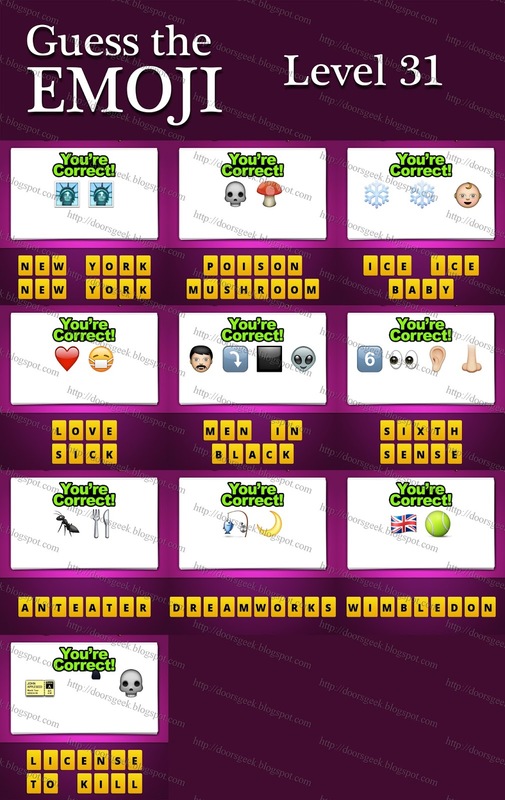 If you are stuck in Level 32 and you are looking for an answer to one of the emoji you will find the correct ones here. French Open - the french flag and a green tennis ball. Second Hand Smoke - the white "2" in a blue square followed by a palm emoji and a lit cigar. Blood Type - the 4 red square emoji that has inside this letters: "A B AB O". Ski Goggles - the man on a orange snowboard and a pair of glasses. High Five - the white paper with a red diagram on it followed by a hand. Sailor Moon - the photo with a water ship inside followed by a yellow moon emoji. Bikini Bottom - the pink woman bathing suit and a hand pointing down. Hotmail - the yellow fire emoji and a blue mailbox. Avatar - the blue ball followed by a alien head emoji. Punch Line - the fist emoji and a curved black line. Guess The Emoji Level 32 Answers, Cheats, Solution for Android, iPhone, iPad. Guess The Emoji is a simple game where you will see some emojis and you will need to guess what they mean. It could be anything, from a famous person to proverbs, movies or quotes. 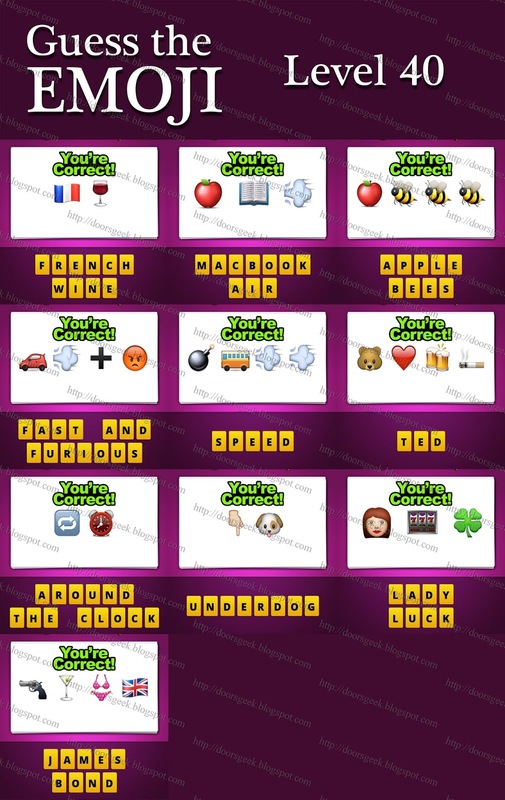 If you are stuck in Level 31 and you are looking for an answer to one of the emoji you will find the correct ones here. New York New York - the two pictures with the head of the statue of liberty inside. Poison Mushroom - a grey skull emoji and a red mushroom. Ice Ice Baby - the two blue snowflakes emojies and a head of a baby. Love Sick - the red heart emoji and a emoticon with a doctor mouth mask. Men In Black - the man with black hair and mustache followed by a blue square with an white curved arrow inside then a black square and an alien head emoji. Sixth Sense - the white "6" emoji followed by a pair of eyes and year and a nose. Anteater - a black ant emoji followed by a eating fork and knife. Dreamworks - the blue fish caught by a fishing pole and a yellow half moon emoji. Wimbledon - the england flag emoji and a green tennis ball. License to Kill - the ticket that has written on it: "JOHN APPLESED World Your 6:30 Zone A 4/1 6:30" followed by a gun emoji and a grey skull. Guess The Emoji Level 31 Answers, Cheats, Solution for Android, iPhone, iPad.